Eurocircuits component database holds component footprint information for all verified parts. These footprints are based on the IPC 7351 standard. 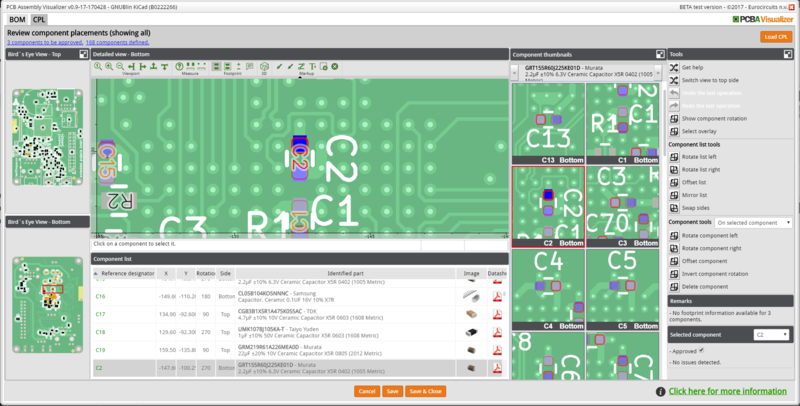 Using this information together with the board data allows checking whether the component will effectively fit on the board. The board is virtually assembled and possible errors can be detected. Of course, the more information there is available, the better the validation mechanism works. With regard to board data, we define 2 levels. In the basic level information is based on the image of the board. 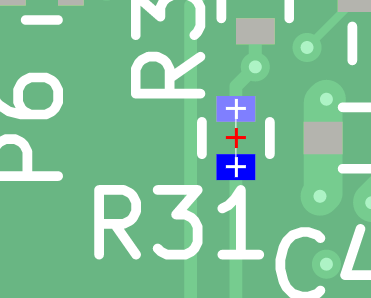 This allows extracting the copper pads which are free of soldermask indicating possible locations for component pins. This level is available for all board data sets. In the advanced level there is extra information available. This is currently the case for board data sets supplied in Eagle BRD or KiCad format. From this data each copper pad is identified with the pad name and the reference designator of the component that is put on that pad. The purpose of the CPL tool is to review the position of each defined component. A component can either be approved or not approved. In case the supplied board data contains advanced information about component pads and pad1 location the approval process can run semi-automatically. When a BOM file is uploaded, for each component that has footprint information this info is checked against the info in the board data. In case all component pins match the copper pads on the board and pin 1 of the component matches the pin 1 pad in the board data, the component is approved automatically. In all other cases, the operator should review and approve the components. Components that are not approved are shown in orange in the component list. 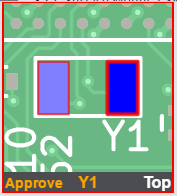 In case a non approved component has a remark based on the available footprint and board data, this component is shown in red. Before explaining the specialized tools to handle the CPL data, it is interesting to take a look at some of the basic functions of the CPL editor. Review bar. This bar contains a filter to only show the components that still need to be approved. Bird’s Eye View panels for top and bottom side on the left of the screen. These show a full top and bottom view of the board, including the components. Detailed view in the center. The red rectangle in the Bird’s Eye View indicates which side and part of the board is shown. Component list. List of components, showing the positioning information and the part definition. Component thumbnails to the right of the detailed view. Because all components belonging to the same part can be treated commonly the thumbnails panel shows a detailed view of all components that belong to the same part as the selected component. Tool panel at the right of the screen. Selected component detail at the bottom right of the screen, showing info about the selected component. All actions in the CPL tab can be undone by clicking the undo button. Use the redo button to redo the last operation that was undone. Click and drag in the detailed view to pan the view. Use the scroll wheel to zoom in and zoom out. Click with the left mouse button to zoom in, right mouse button to zoom out. The toolbar at the top of the detailed view also contains the necessary button to control the view. 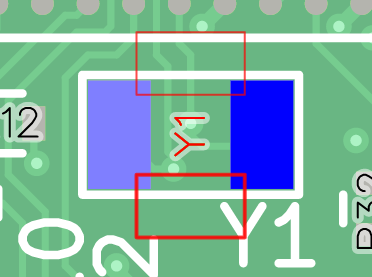 To change the side of the board that is displayed in the detailed view, either click on the Bird’s Eye View of the side you want to see, or use the Switch view button in the tool panel. Select the reference designator for the listbox in the selected component panel or type the reference designator while the listbox has focus. Selecting a component will make it the current component. 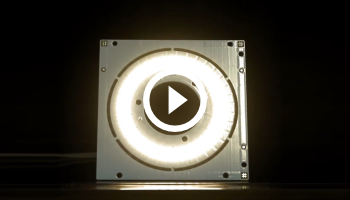 In the detailed and bird’s eye view this component will be shown in red. Other components from the same part definition are shown in orange. 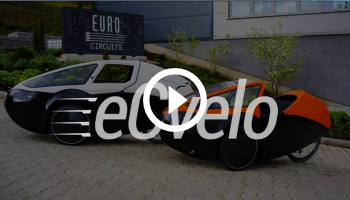 The thumbnail panel is adapted and the selected component is shown with a red border. The selected component panel is updated with the available information about the component. In case the board data contains pad information this info is used to highlight the pads of the selected component and the components from the same part definition. All pads are highlighted in light blue. In case there is an indication of the pin 1 pad this pad is highlighted in darker blue. The footprint information is shown as a red/orange outline. The outline of the pin 1 footprint is shown as a thicker line. It is possible that the coordinate system used for the board data is different from the coordinate system used in the loaded CPL. In this case all components will have an incorrect position. The Component list tools in the toolbar on the right can be used to correctly position the data on top of the board data. Remark: these function work on the components on the currently selected side. Rotating the list will rotate all the coordinates of the components 90 degrees clockwise (right) or counterclockwise (left). The rotation of the components will also be recalculated accordingly. Remark: The rotation is around the origin of the coordinate system (0.0, 0.0). Using the Offset list tool you can offset and scale the whole list in 4 steps. Scaling might be necessary in case the coordinate unit is incorrect. A wizard will guide you through the different steps. Step 1: Define the first reference component. On the board image you can determine which component should be used as a reference. It is advised to use a simple 2 pad component that is clearly identified in the board legend. 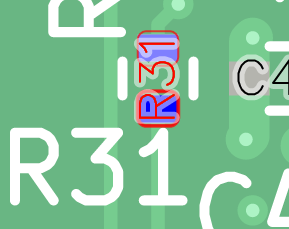 In this case we will use R31 as a reference. 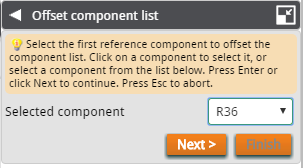 Either select R31 using on the component selection methods, or select it from the listbox in the Offset component list wizard. Step 2: Define the centroid of the selected component. When moving the mouse cursor over the detailed view, a white cross will snap to specific locations on the board. E.g. the center of a copper pad or the end of a line in the legend layer. To position the centroid of the component at the current position, click with the mouse. To position the centroid of the component in the center between 2 positions, hold down the mouse button at the first location and move the cursor to the second location. A red cross will show the selected location. Hold down the Ctrl key to only change the X coordinate. Hold down the Ctrl and Alt key to only change the Y coordinate. Release the mouse button to accept the position. In case the no scaling of the list is necessary click the Finish button to finalize the offset. Click the Next button in case a scaling is necessary. Step 3: Select a component which is as far as possible from the first reference component. Step 4: Select the position of the second reference component. All component positions will be recalculated using both reference components as fixed points. Use the mirror list function to mirror the X coordinate of all components. The component rotations are also mirrored (e.g. 90 degrees rotation becomes 270 degrees). 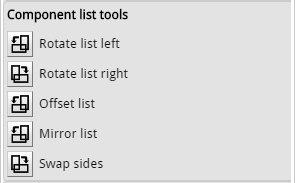 Use the swap sides function to reverse the side of all components. Top components will be placed at the bottom and vice versa. The available data for each component (footprint and board data) is checked against each other. Depending on the available data a number of different remarks can be generated which are shown in the current component panel. Position not defined – The CPL does not contain a position for the component. Use the offset component function to define the position. Part not identified – The part definition of the component is not yet identified. Go the the BOM tab page to identify the part. Component outside outline – The centroid of the component is outside the outline. No footprint information available – In case no footprint info is available, no further checks can be performed. This is the case for part definitions that are not yet available in the Eurocircuits database. When the data is saved the part definition is automatically added to a list of parts that need to be added to the database, so when checking later on it is possible that the footprint information is already available. The component pads do not match the copper pads – In case there is no pad information available in the board data, we check whether the center of each of the component footprint pads is on copper free of soldermask. When this is not the case, this remark is given. 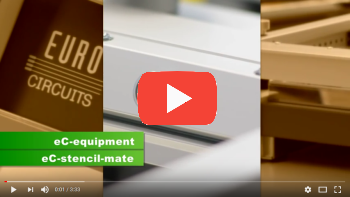 In case there is pad information, we check whether the center of each of the component footprint pads in on a pad of the given component reference designator. Either the component centroid position is incorrect and/or the component rotation is wrong. 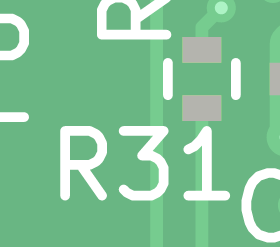 Pin 1 does not match the copper pin 1 – This remark can only be generated in case there is component footprint information about the pin 1 location and board pad information about the pin 1 location. Since not all components can be automatically verified a semi-automatic approval mechanism is in place. This means that at least some components need to be manually verified and approved. An individual component can be approved by checking the Approved checkbox in the Selected component panel or clicking the Approve button in the thumbnail panel. All components of the same part definition can be approved at once by clicking the Approve all button in the thumbnail panel header. In case all components are approved, the To be approved filter will be removed from the Review bar. A number of tools are available to change/correct the component position. On selected component – Using the tools will only change the selected component. On selected part – Using the tools will change all components that use the same part definition as the selected component. On all – The tools will work on all components. Remark: When the To be approved filter is active, the scope of the components will always be limited to components that are not yet approved. Changes the rotation of the components in scope 90 degrees clockwise (right) or counterclockwise (left). To position the centroid of the component in the center between 2 positions, hold down the mouse button at the first location and move the cursor to the second location. A red cross will show the selected location. Hold down the Ctrl key to only change the X coordinate. Hold down the Ctrl and Alt key to only change the Y coordinate. Release the mouse button to position the centroid of the selected component on the selected location. The same offset will be applied to all other components in scope. Inverts the component rotation of the components in scope. E.g. 90 degrees becomes -90 (or 270) degrees. Deletes the components in scope. 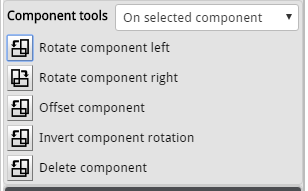 To manually set the rotation of a component, double click the Rotation field in the Component list to make it editable. Enter the value and press the Enter key to accept it.